1. Preheat your oven to 130°C. 2. Mix the potatoes, onions and thyme leaves together in a bowl and season well with salt and pepper. 3. Tip into a roasting tray and make sure they are level. 4. Lay the lamb shoulder on top of the potatoes skin side up. Using a small knife, pierce a number of holes all over the lamb and push the peeled garlic into these holes. 5. Pour over the chicken stock and place in the oven for 5 hours, until the lamb is tender and the potatoes are cooked through. Remove from the oven and allow to rest for at least 20 minutes. 6. Meanwhile, heat a griddle pan or a fan pan on the stove. Toss the broccoli in a little oil and add to the hot pan. Cook this like steak, so don’t shake the pan around too much. Leave it to develop a good amount of char before turning. 7. Once you have a good colour, season all over with salt, add the lemon juice and butter then give this a good stir to coat. 8. 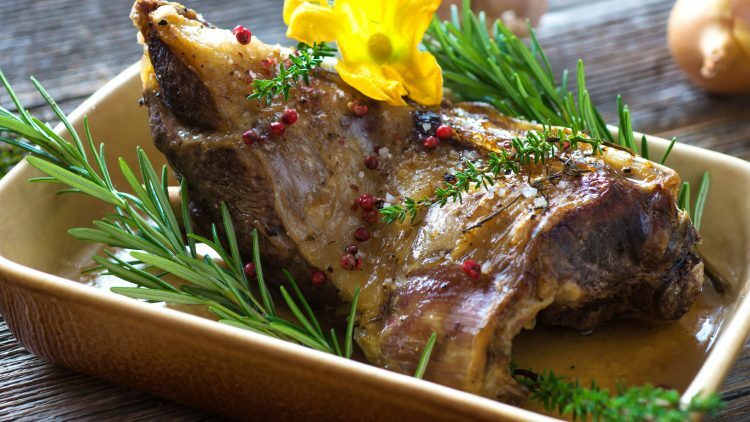 Carefully place the lamb shoulder on a separate serving dish. For ease of serving, place it all in the middle of the table for your guests to help themselves.